Alessandro Piccinini, a contemporary of Monteverdi and Frescobaldi, hailed from a Bolognese family of lutenists that made its mark on Italian musical life for over one and a half centuries. At the court of Ferrara, Alessandro became familiar with the development of a new kind of lute that would later be designated as the archiliuto. This instrument is notable for its second extended neck to accommodate drone strings, and was enthusiastically taken up by contemporaries such as Carlo Gesualdo. After a longer sojourn in Rome, Alessandro Piccinini returned in 1611 to Bologna, where he published his lute works in 1623 after a lengthy preparation. The preface to this (first) volume contains a fundamental introduction to playing the lute and chitarrone - then, as now, it was a decisive source for lute technique. After Piccinini' death, his son Leonardo Maria published a second volume with lute pieces by his father in 1639. Stylistically, Piccinini's lute works are influenced by the emergent Italian instrumental music, but French and Spanish influences can also be clearly heard. 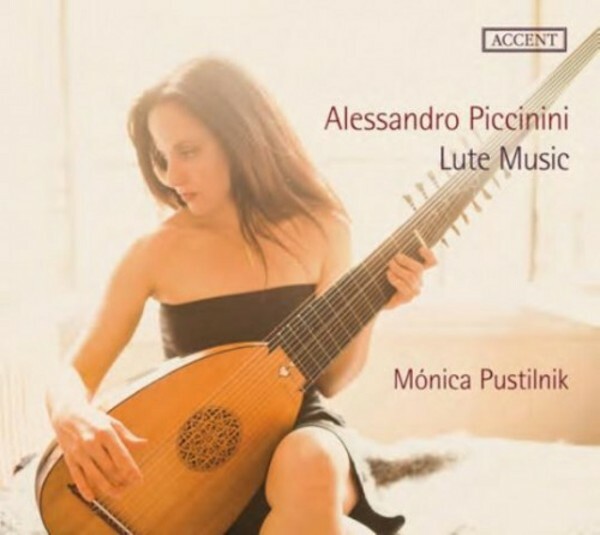 On the present recording, M�nica Pustilnik introduces a selection from both of Piccinini's lute books. The lutenist, from Buenos Aires, is much in demand as a soloist and chamber musician. Alongside these activities, she can also be regularly heard in outstanding ensembles for historical performance practice, such as Le Concert d�Astr�e, Les Musiciens du Louvre and Les Talens Lyriques.